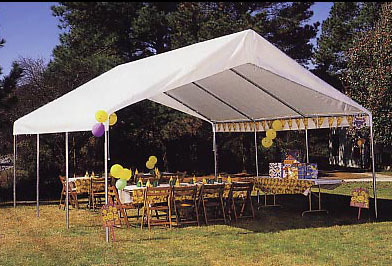 The Hercules 18x20 is great for large outdoor parties or shelter for two cars. It is a very sturdy unit with a 2" powder coated frame. It also comes with plastic foot pads to protect the surface that it is placed on. Is the Fire Rated Tag permanently attached to the fabric? This item is NFPA-701 Flame Certified. Per the manufacturer, the tag is sewn into the canopy. What is the thickness of the canvas/plastic? The top is a 5.3 oz Polyethylene fabric. How many months of continuous use would the cover lasty? That will vary based on weather conditions and use. In my experience most replacement tops are purchased in the 12-16 year mark. Some sooner, some later but that seems to be a fair avg time period. 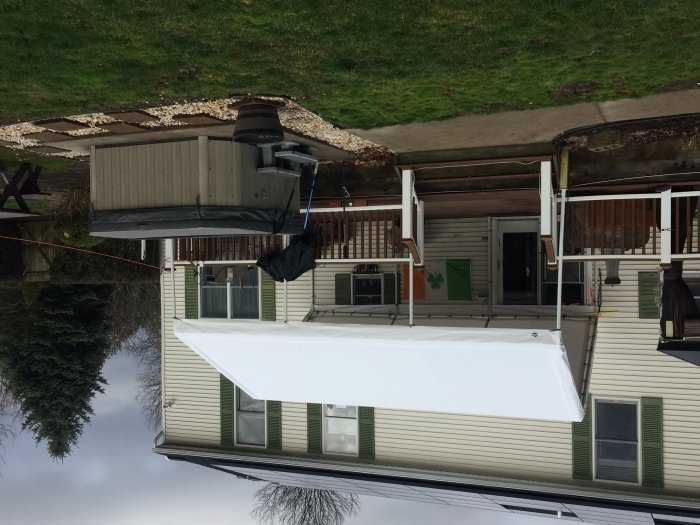 The Hercules 18 x 20 Outdoor Canopy is indeed fire retardant. This canopy is water resistant, not waterproof, according to the manufacturer. Thank you for your inquiry! The top is a 5.3 oz Polyethylene fabric and the frame is white powder coated steel 2" diameter. Does this canopy come with UV protection? Thank you for your inquiry. 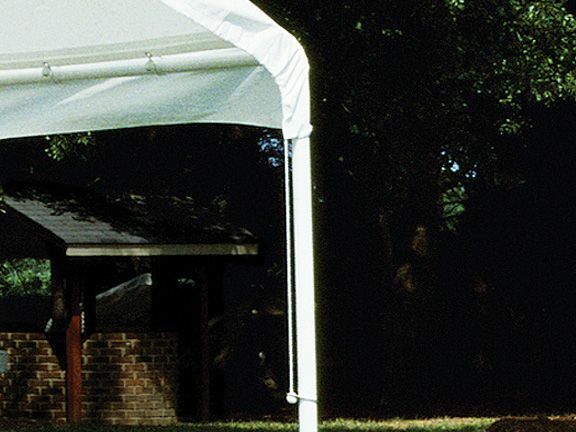 The 18 x 20 Hercules Outdoor Canopy Shelter from King Canopy has UV protection, as do all of the King Canopy products. How do you recommend anchoring this tent down in the situation where you have to set it up on a hard surface? This shelter could be anchored on a hard surface such as concrete, but it does not include the materials for doing so. You may purchase things like concrete bolts from your local hardware store. Depending on the equipment used, they would be able to advise you on the correct application for securing this to your surface. Are the poles of this canopy the typical height adjustable type? 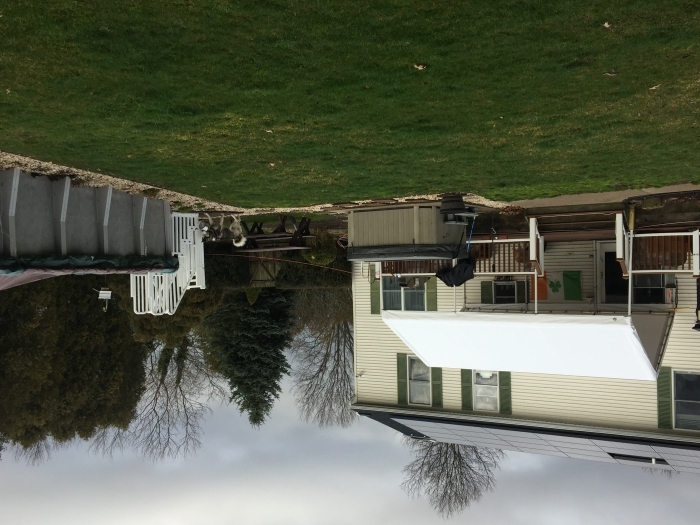 The height on this unit is fixed at a 11'6" for the peak height and 6' 8" for the side height. Do you have a replacement top for this canopy? Yes, we do have the replacement top available for this 18 x 20 unit. Does this need bolts and guide wires or does it just slide together? There are no bolts required, but guide lines are used. Please view the manual for complete details. How long can I leave this set up? Can it serve as rain cover for horses? You can leave it up in fair weather. However, it is not rated for snow, ice, or high winds. 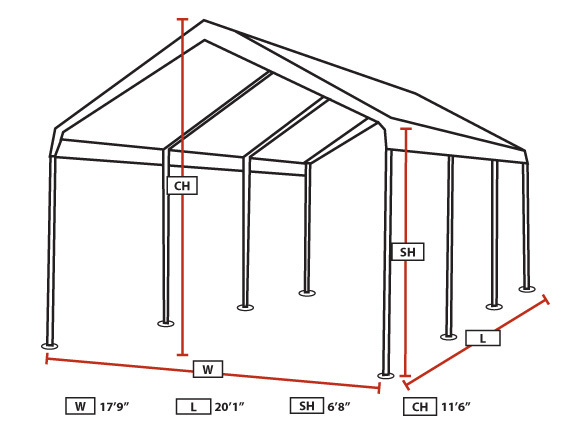 We also carry shelters specifically made to serve as rain covers for horses. Please type the word "run-in" in the search box to see the sizes we carry. Is this canopy made out of fire retardant material? Indeed, it is. This unit is rated to both CPAI-84 and NFPA-701 fire certifications. 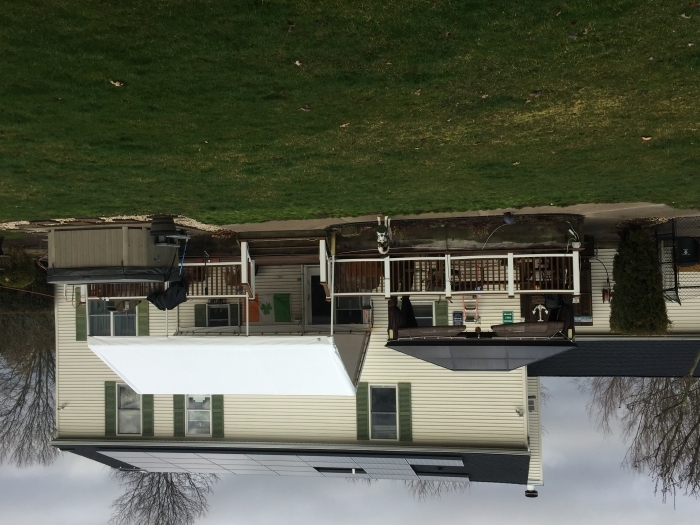 Can extra side pole sections be added to increase the height? No, we do not have that ability. Hi. Is there walls for this kind of tent? I need something that size, but I need wall on the sides and on the door to close during the night. Excellent quality and great value! Be sure to follow canopy instructions! Having 2 people makes it much easier! Mine is 18 x 20. I secured it to the house and deck to reduce risk of winds. Very sturdy.